SanDisk 's new WiFi-equipped Sansa Connect MP3 player is not going to launch in Europe. The unique player launched yesterday in the US and sold out on the first day. The new player sports an array of Wi-Fi capabilities designed to put the Microsoft Zune to shame. But SanDisk is saying that it has absolutely no plans to launch the player in Europe, where its Sansa MP3 players have not been quite as successful as at home in the USA. As yet there has been no official reason given by SanDisk, nor an official announcement as to why its new player won't be launching in Europe - the news came to us through back channels. 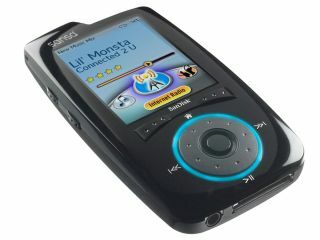 SanDisk has also announced a partnership with Yahoo Music, which involves Yahoo providing unique music services for SanDisk's new Sansa Connect, a Wi-Fi-enabled MP3 player in the USA . The partnership pairs SanDisk's new wireless MP3 player with both free and subscription-based services from Yahoo, enabling consumers to stay constantly connected to their music, photos and friends via Wi-Fi, with no PC required. The flash-based Sansa Connect MP3 player boasts several Yahoo features that can be accessed with the simple click of a button and an open Wi-Fi connection. Owners with a Yahoo! ID can listen to LAUNCHcast Internet radio, browse Flickr sets and photos, and see what their Yahoo Messenger friends and other Sansa Connect owners nearby are listening to. Sansa Connect users with a 'Yahoo Music Unlimited To Go' subscription in the US are also able to discover and download music, as well as listen to or download tracks their friends are listening to or have recommended. When the 4Gb Sansa Connect is not connected to a WiFi network, the player behaves like a traditional Flash MP3 player and can be connected to a PC. Users can play music and view photos stored either on the player or on an optional microSD card. "The Sansa Connect is a new breed of music player," said Daniel Schreiber, senior vice president at SanDisk's Audio Video Business Unit at the launch. "It untethers consumers from their computers, and allows them to get new music and share their recommendations anytime, anywhere - over an open wireless Internet network." The Wi-Fi features are exactly what most people were hoping would be included in Microsoft's disappointing Zune player. It only has very limited WiFi features. The news of the cancelled Euro Sansa Connect launch will delight Microsoft, who does have plans to launch a Zune in Europe later this year.